Another interview I did in a tag-team format with Brian Woodson of the Bluefield Daily Telegraph was with former-Blue Jay Paul Quantrill. Quantrill is now officially listed as a “consultant” with the Jays and is serving as a roving instructor/mentor to the young pitchers in the Blue Jays’ system. Brian Woodson: What’s your role right now with Toronto? What are you doing in Bluefield? Paul Quantrill: This is my first year doing this and I guess I’m working with the pitchers and my job is really just to come and spend some time with the young lads and get to know our staff as well, you know, tell them some lies and some stories from when I played. But I think mostly my job is to give perspective to them as to some of the things they need to do, and not so much even technically, Tony [Bluefield pitching coach Antonio Caceres] here is fantastic, but, you know sometimes you need another voice because they hear the same guy every day and I can tell them that maybe [there’s] a direction that they need to start to heading or applying themself in a certain manner better than they have been and hopefully help themself move along. BW: You had a pretty long career, I think you pitched 80 games four or five times in one season. Were you satisfied in what you were able to do in your career in, what was it, thirteen, fourteen years? PQ: Yeah, it was that, and [I’m] more than satisfied. I certainly wasn’t the most gifted player but I did my job and I’m a real blue collar worker and put in my time and felt like I made a contribution to each and every team I played on. BW: You were always more of a middle reliever type, I guess. And that has become such an important part of a pitching staff now maybe when you started maybe it wasn’t as important as it’s become. PQ: It was about during my generation where it became so specialized that really that I pitched more eighth innings than probably anyone for ten years because it didn’t matter how good the starters were going you took him out. It just became part of the game and even more so now, it becomes so specialized. You know, that’s not such a bad thing, i mean [it] saves the starter’s arms, in the past it used to be the starter’d go nine. Those days are long gone now. BW: That’s true. Do you ever see that coming back? PQ: I think that if a guy is going good and if they’ve trained their body to stay and go longer in games, that’s fine. I guess it’s no different than it’s always been is that it’s a tough decision because the manager, with the help of the pitching coach, they have to decide “is my specialty guy now, is he a step up from where my guy who’s gone seven innings, he’s getting tired, or six innings?” So I guess it’s always been the same, it’s just that in the past, they didn’t have as many specialty guys that could come in . . if you were that good, you had to be a starter. Now you’ve got guys out of the pen throwing 100 miles an hour. It’s crazy. PQ: I think it’s a one-time thing. I personally think that at times we’re probably overprotective and yet I think that if young men train their bodies and men train their bodies to go a certain number of pitches . . . every game’s different though, there’s times you go nine innings and hardly feel like you’ve worked, cause I started a good chunk of my career, other times you go five innings and you’ve just had it because if they work you over one inning where you throw thirty-plus pitches. That seems to be what gets guys more than anything. Lincecum’s got really good mechanics but that’s about as far as I see it stretching, isn’t it. PQ: You do [hate to take him out], but as you guys pointed out earlier here is that when you have some really spectacular pitchers out of a pen, when a guy, it’s not just that he’s getting tired and even when he’s got his stuff working, it’s the third time around the order. These hitters, I like to tease them that none of them are too bright, all of the big leaguers, but collectively they’re gonna beat you up. They’re large men with pieces of wood in their hand so sometimes it really comes down to, it’s the manager’s decision because every competitor wants to keep the ball in his hand and the top pitchers always want the ball, but simply put I think there’s time where the specialty . . it’s habit for a reason. It’s not because we’re all crazy in this baseball world, it’s because when you can bring in a guy that’s fresh, that’s not tired, and they haven’t seen him that particular day it can make quite a difference. BJfA: Seeing how effective the Blue Jays’ bullpen has been this year, how many guys they have and how deep it is. Does it give the younger players a little bit more encouragement in a bullpen role? PQ: I think so, especially because some of the guys who have come up and really made a difference with the Blue Jays, it hasn’t necessarily gone as planned from a pitching perspective, but they’ve built depth there. And Alex and the entire staff seem to do a real good job about you know, it’s great if you have 1 through 5 and seven guys in your pen and you think you know how it’s supposed to work but it rarely does. You know, Sergio gets hurt and this guy gets injuries, it’s just part of the game, it’s a terrible part of the game but when you build in depth these guys will come out of nowhere. Delabar and, you know it’s wonderful to see some young guys step up and come around and McGowan’s back now. To me, that’s as exciting as anything that’s gone on with our organization this year is to see some young guys step up and come out of the woodwork, even more than could ever have been expected of them. BJfA: I just have one more question that’s what do you think is the most important thing that young pitchers need to learn and they probably don’t learn it until they get to pro ball. PQ: I think from my perspective it’s never mechanics. They’ve got worlds to learn and stuff but and even the game. I think the biggest thing is to compete. Because so many of them, if they’re playing pro ball, 90% of them were the best at their school and they were the best at their college. And they’ve just been that guy. Most of them always were that guy or the top two or three guys. When you surround them with everyone that’s as good as them, or better, sometimes it intimidates some of them. I think from my perspective, that’s what I like to talk to them about. I certainly wasn’t the most talented in my group coming up through even with the Red Sox organization, but what you can learn pretty quickly, if you’re a person that likes to learn to learn and sometimes that’s what school teaches you I think, if you learn to learn, you see that we all have our niche or specialty thing that we’re good at or otherwise we wouldn’t be playing pro ball and I remind them that you might not throw 96 like this guy over here but he’s having a hard time hitting a barn door and you’re painting. And that can be the difference that makes you special and I like to see guys get the most out of their ability. If that means the big leagues then I’m gonna be very very pleased for them and for the organization, but if it doesn’t mean the big leagues, as long as they look back on their career and say “you know what, I gave it the best I had” and so, for me, the most important thing is guys with high compete level and don’t get intimidated by those around them or the other team and I love watching guys like that. BW: Do you see that attribute in some of the guys here on the pitching staff? PQ: Yup, Oh yeah, for sure. And some of them, you see it, but at times you see them back away from it because things will go awry. And that’s the thing with young guys. It’s just that you have to come into their… you see it and you so desperately . . . and as a coach I’m impatient sometimes and I just want to wring their neck and it’s like “come on, you got it all, you’re goin great and then one little thing went awry.” And even the other night when Tommy Robson, I’ve known Tom for quite some time, I coached him on our junior national team up in Canada. He got that weird call on a hit by pitch and Dennis had a little argument there and got . . . [laughs. Manager Dennis Holmberg was ejected after that exchange]. Well, Tom comes back and throws four balls in a row, and as a coach, I know Tony [pitching coach Antonio Caceres] would have liked to go out and strangle him but that’s just part of the maturation and then he went right back to work and did what he did the rest of the game and dominated the game and he’s a special kid. To see young guys kind of figure things out and go through the rough spells. When the light goes on and you see them take off, I think that’s why we coach. BJfA: Can I just ask you one thing about Robson. I had a lot of trouble seeing during the game but he really impressed me. How much does his ball sink just naturally? He gets a lot of ground balls and people I’ve talked to around here are telling me that’s his M.O., if he pitches five innings and gets 10 ground ball outs that’s pretty much par for the course from him. I just want to know because I couldn’t see from the vantage points that I had, is there a lot of sink on the fastball that he’s throwing? PQ: Very much so. I guess Tommy wouldn’t have been classified earlier, younger, as a definite sinker-baller, because he used to get around the ball, but when he stays on top and behind the ball, really, it’s very very difficult for guys to lift it. And any level, it doesn’t matter if it’s here or at the big leagues, you get ground balls and it takes a lot of ground ball singles to get a run. So if you can keep them from knocking it over that green wall out there you can be a pretty happy character. Not to mention that Tom is spectacular at getting ground balls but even on top of that it keeps away from doubles and home runs but his secondary stuff is pretty darn good now. His changeup has come a long way, so if you can pound at them with those low sinkers then either you get a quick, easy out or get them before you know it they’re 0-2 or 1-2 and then you can add that secondary pitch and finish them so he’s come a long way. Tony does, I think, you know, having seen the kids here and how they’re maturing, he does a fantastic job. BJfA: Would you compare Robson a bit to Marcus Walden who I talked to Tom Signore about and he really loves the way Marcus Walden pitches. PQ: Yup. Similar, yeah. Some definite things that are very close, for any of them, that’s the other thing, whether they do it with their teammates or within the organization or even outside, it’s good to see what other guys do and how they have success but I always warn young men that you are who are you are. Certainly you want to find a comparable someone … “He kind of pitches like me” … he kind of gets results, not on the line score, but on the field . . is there anything that he’s doing that I can emulate and copy, steal. But you do have to be careful because as a coach, I certainly wouldn’t team them to pitch like I did, I threw nothing but fastballs, but it’s good when you steal ideas but don’t try to make it, you guys have seen it our sports world, inevitably, some young superstar comes along and we say, he’s gonna be the next Nolan Ryan. There’s nothing worse that can happen to a young guy. And even with it’s amongst two guys on a team, you know, some guys they develop at different stages. I don’t compare kids. I know Robson gets ground balls like crazy and he’s gonna be a good one. That’s all for the Quantrill interview. We’ve got one more interview from the Bluefield trip to transcribe for you and that’s with Canadian Baseball Hall of Famer Tim Raines. 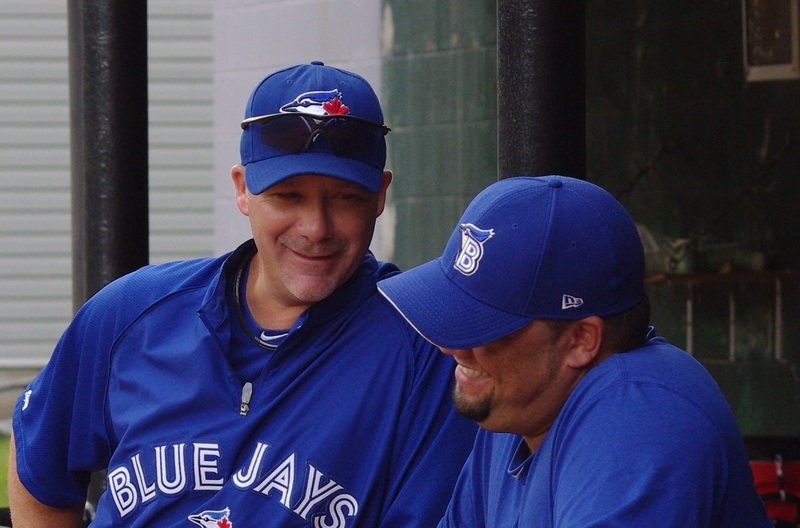 Our conversation (also with Brian Woodson) was wide ranging covering his duties with the Jays now, his Hall of Fame calibre career, induction into the Canadian Baseball Hall of Fame, and the Expos.